In recent years the medicinal herb comfrey has, if not exactly withered under the microscope of modern science, at least shriveled slightly. At one time people suffering from stomach ache drank comfrey root tea, while visionaries hailed comfrey leaves as a promising alternative to spinach. Yet we now know that taking comfrey internally can damage the liver. While old-timers still use the roots in external applications, modern complementary and herbal medicine practitioners recommend using the leaves only. The shrub-like comfrey herb grows up to 5 feet tall, with broad leaves and dozens of small blue, white or purple flowers adorning each plant. Below the ground long, thin taproots extend as far down as 10 feet. This root is black on the outside, while its juicy interior is white, according to the University of Maryland Medical Center (UMMC). Comfrey plants can be somewhat invasive; keep them away from easily-overwhelmed flowers and herbs. The leaves and roots of comfrey both contain compounds that reduce inflammation. Additionally, both contain the substance allantoin, which is associated with cell regeneration. 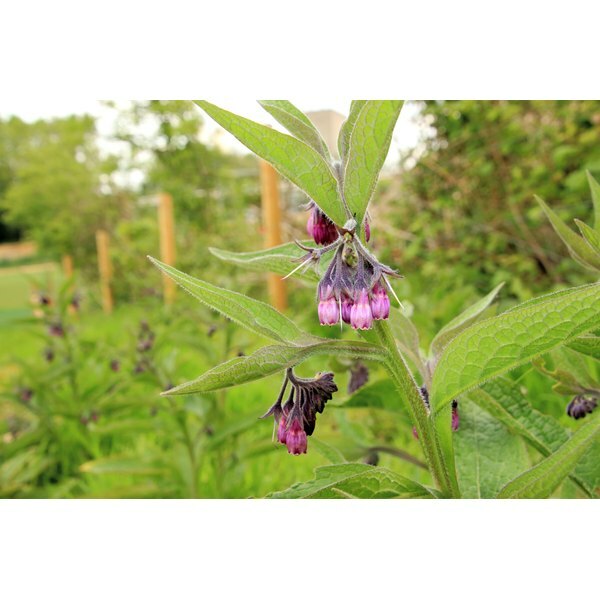 Therefore, herbalists recommend topical comfrey products for a wide range of uses, including facial creams, bruise ointments and muscle pain salves. Folk recipes mention using comfrey root tea to cure stomach upset and eating comfrey leaves fresh or cooked as a general tonic. However, health officials now strongly discourage any internal use of comfrey. The compounds in comfrey’s leaves and roots--pyrrolizidine alkaloids--are toxic and may damage the liver, cautions UMMC. The U.S. Food and Drug Administration has banned the use of comfrey in herbal supplements since 2001. Other countries followed suit. If you’re making your own comfrey salve, UMMC strongly recommends using only older leaves. The younger leaves and roots contain higher amounts of the dangerous pyrrolizidine alkaloids, which can be absorbed through skin. Many herbalists still prefer the roots to the leaves because the roots contribute more skin-soothing mucilage. But roots may also hold as much as 16 times the level of the alkaloids, warns UMMC. Both the roots and leaves of comfrey help in organic gardening. Use comfrey leaves for mulch; their broad leaves cover a wide area. In the compost pile, comfrey leaves help speed the decomposition of tree leaves, grass clippings and other organic materials. Because comfrey plants grow so rapidly, feel free to harvest the leaves several times a season. Herbalist Lesley Bremness suggests soaking comfrey leaves in water to use as compost “tea,” which adds needed potassium to mineral-poor soil, as well as potato and tomato plants. Finally, “Gaia’s Garden” author Toby Hemenway notes that comfrey’s long tap roots also come to the aid of the organic gardener by loosening clay soil. Grow comfrey for a season and then pull it up to turn the soil. The long roots pull deeply-buried soil minerals from the subsoil to the top, making it available to other plants, according to Hemenway.